John Zimmerman has spent more than 20 years developing and marketing luxury properties in the Fort Worth area. His business is built on two principles—connections and commitment. With a vast understanding of the market, John Zimmerman has created a successful formula with extensive data research, analysis and, of course, the knowledge of closing the deal. He has been recognized in Fort Worth as the top producing agent for four consecutive years and he was awarded Briggs Freeman Sotheby’s International Realty’s Top Producing Team Award in 2014, 2015 and 2016—right when we started doing business. The new look for John Zimmerman emerged from a focus on creating a sophisticated, strong mark. Our goal was for the brand to reflect John’s quality service and expertise across all of his materials. By designing a typographic logo and a logo mark, personality is carried into the John Zimmerman brand. The real estate industry is heavily saturated with advertising, mostly done in-house by title companies. 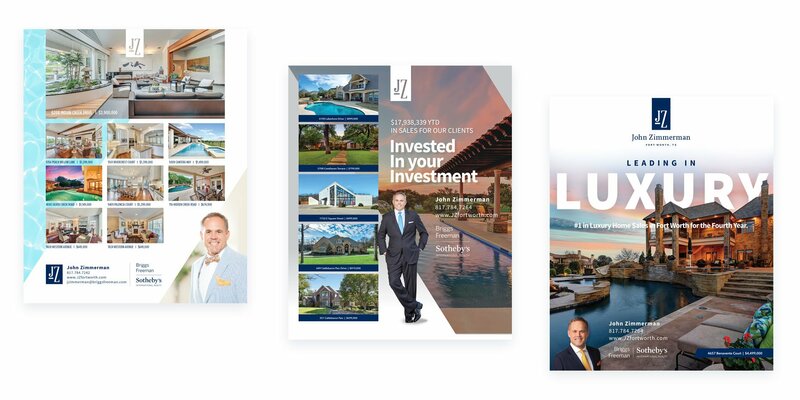 Many publications will print page after page of what are, seemingly, the same ads showing a grid of thumbnail property listings with a small headshot of the realtor. While we see the value in listing properties (it is the essence of the product, after all) we found an opportunity in the market to highlight the person behind the sale. 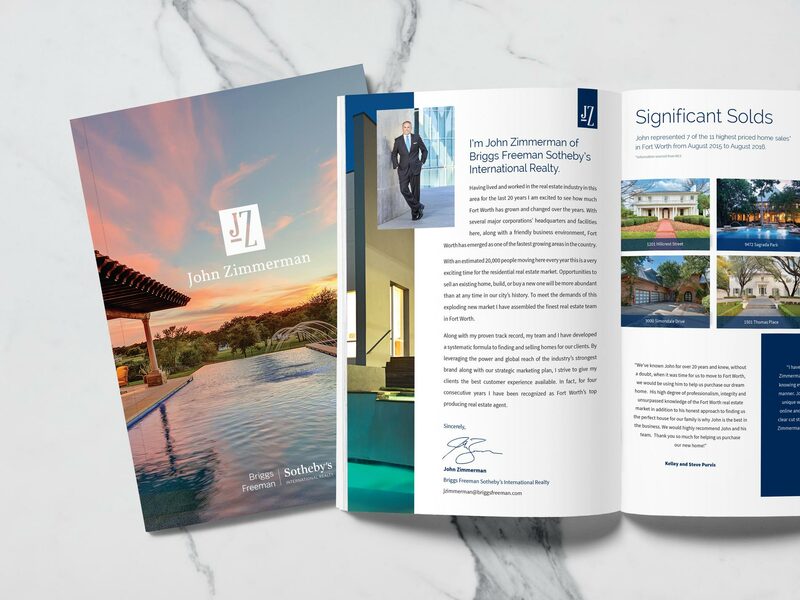 It is our experience that established trust is very congruent with sales in this market, so we made it our mission to create a brand that made John Zimmerman stand out among his competition as THE realtor in town, rather than just another page in a magazine.